Grab friends and pedal an overnighter on the Little Traverse Wheelway. A two-wheeler newbie bikes the trail from Charlevoix to Harbor Springs then rides back the next day. 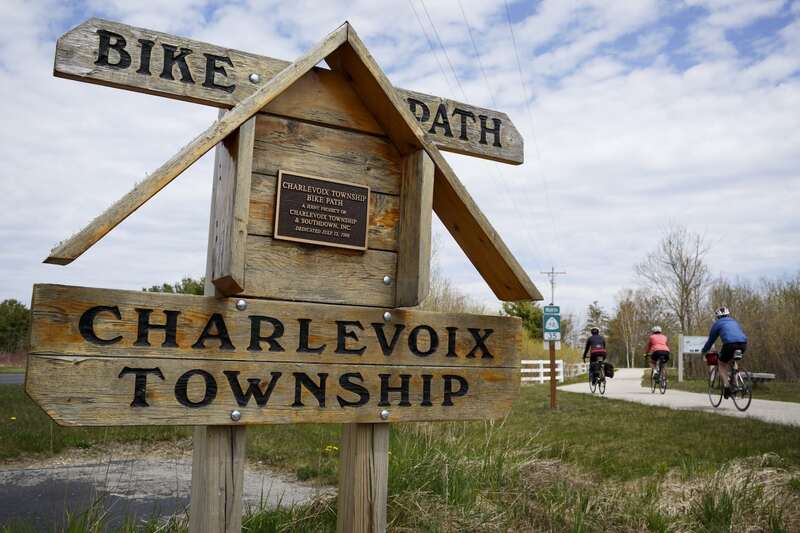 My phone rings, and it’s my Traverse editor asking if I know the Little Traverse Wheelway Trail, a 26-mile, paved trail connecting Charlevoix to Harbor Springs. He was hoping I’d find a few friends and go on an overnight bike trip and share the story. “I’d love to!” was my immediate response. What I didn’t mention is that I’d never been on a road bike nor ever biked 26 miles. I’ve learned to choose wisely with whom I surround myself—especially when on an adventure. I’m fortunate to have a heap of adventurous friends, so I’m blessed in being able to cherry-pick travel compadres easily. My mind immediately springs to a group of friends who are organized, know bikes and like a challenge. I’ve also known them since kindergarten, so this means I’m grandfathered in (as in, even though I’m not organized, nor do I know bikes, they’ll let me be a part of their challenge). As I knew they would, they brought their A-game, along with plenty of patience and keen senses of humor because, well, you need humor for these sorts of adventures. A couple of great things about the Wheelway Trail are that it’s largely flat, so most people can pedal it, and it has several spots along the way to hop on and off so that you can build your own adventure. In our case, my friends and I are moderately athletic, so we chose to approach the trail on road bikes. We also chose to stay overnight and take our time versus up and back in one day (although the 52-mile round-trip is doable for intermediate to advanced riders). 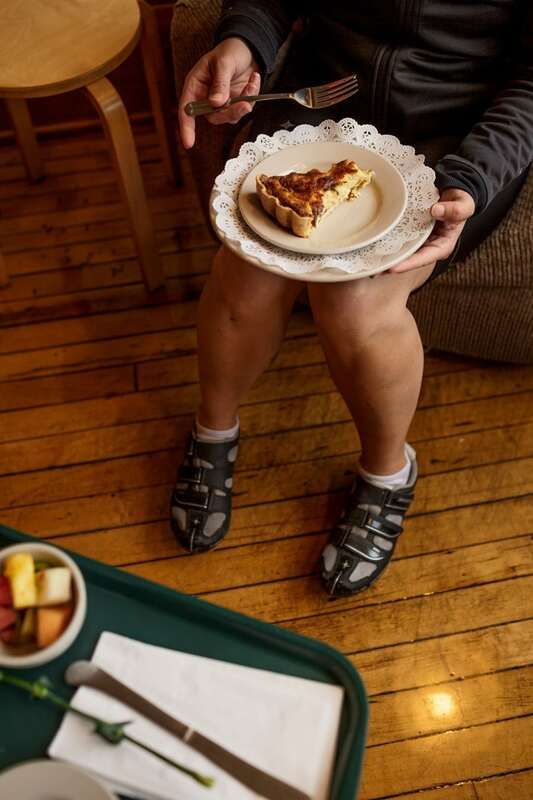 As this ride took place in mid-May, and Michigan weather can be bi-polar, we packed layers to keep us warm and dry and to give us the option to layer up or down depending on the conditions. We also packed a change of clothing and basic overnight essentials into two saddlebags. It’s important to study weather, too. We knew we had a chance of rain, and that even if it were to become sunny, the cool air might need some blocking with a windbreaker. McClain’s installed a rack on the back of my bike, and I then added a set of saddlebags and bungee-cord-rigged my camera bag and tripod (my friend, Karen, had the other saddlebag). It’s important to me to carry my own weight—cameras can weigh a lot! We also each carried our own supply of water and snacks. We arrive in the early afternoon at Charlevoix Township Park and leave our car here, as it’s permissible and the lot is safe and near the trailhead. Our first task is to unload the car and spread out our gear on the pavement so we can pack as minimally as possible, together. We have only two saddlebags, which means one side for each person. Once re-packed and organized, we do a few loops around the parking lot to make sure our loads are secure, and we have our balance. That is when we realize our first forgotten item, bike cleats for my friend Chris (for non-bikers: the cleats clip his shoes to his pedals). 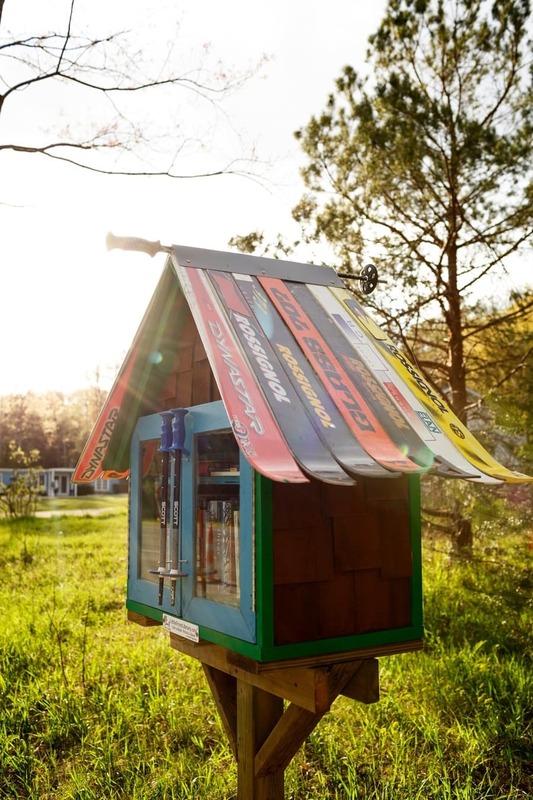 Through Google we search and quickly locate Latitude 45 Bicycles and Fitness in Petoskey, not too far from the trail. We assess and decide Chris can ride the roughly 15 miles to Petoskey without the cleats, so we proceed. 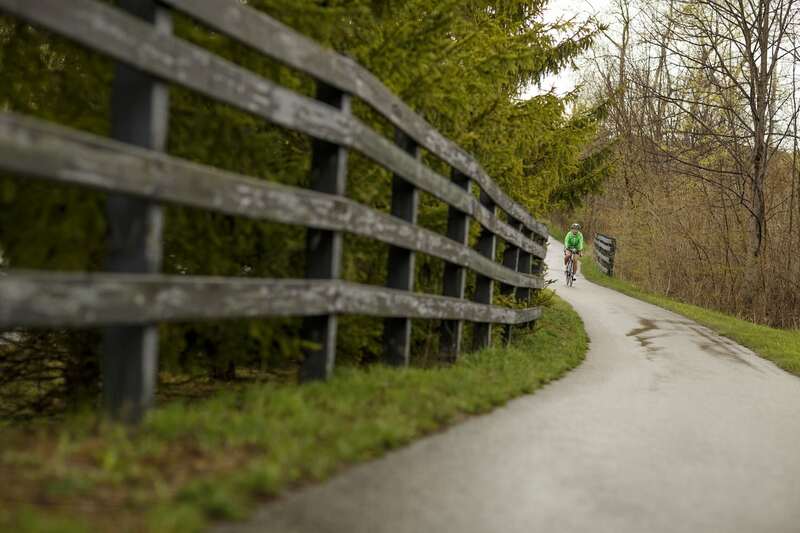 A short bike ride up from the Township Park, at the intersection of Waller Road and US31, is where the trailhead is located and where we embark upon our bike adventure. A portion of this first section of trail incorporates a wooden boardwalk built over wetlands. It is there that I make my friends do their first “one more time” (but really several more times) biking back-and-forth in front of my camera. It’s also here I realize I’m going to want to stop often for photographs because already there is so much to take in. I then hear this: “There is plenty of trail yet ahead!” from Chris. Later I’m told that my other two friends, Karen and Katherine, leaned over to him and whispered that he’ll need patience with me on this ride. Good thing we factor in plenty of daylight hours because even though 26 miles isn’t all that long on a road bike, we planned to take our time. The trail is relatively flat which made for an enjoyable ride with our packed gear. Along the way we cruise through sections of tree canopies and are greeted often by views of Lake Michigan. Roadside parks along the way provide restrooms, water, picnic tables and public areas to explore the shoreline. The trail is well marked with maps and signs and tidbits of history on the area. The older I become the more I enjoy reading these signs. My friends agree, and we read them together. Our stops continue and we discover plenty of options. The trail seems well planned for a range of rider ability. One stop is a wheelway bridge that stretches over US31. From atop the bridge, Karen catches the attention of a semi-truck driver and gives him the arm signal to honk his horn; he does. 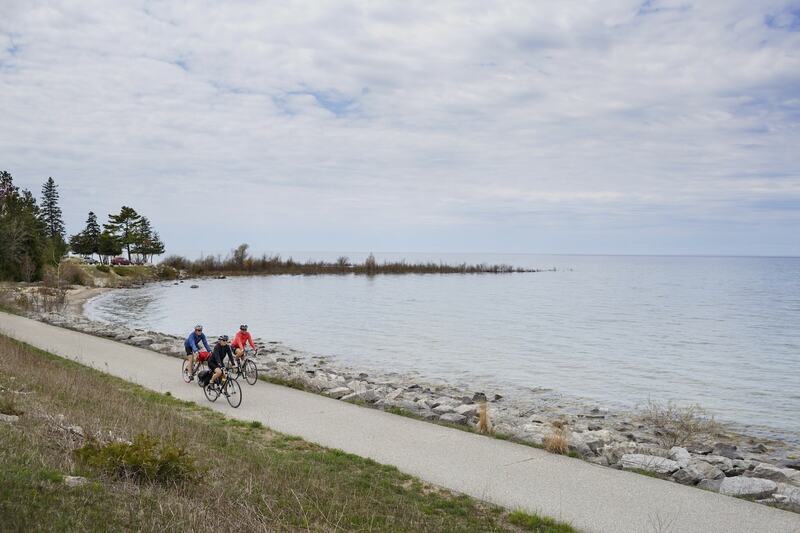 We also choose to ride through Bay Harbor development to check it out and to breathe in a view of Lake Michigan from the vista of East Park. At one point I add a brilliant twist to one of my photo op stops. I climb up a hillside for a unique point-of-view. I clearly did not think this through, because on my way down I lose footing and tumble, landing on the pavement and skinning my knee. It is then that we realize our second forgotten item, a first aid kit. The alternative: we MacGyver a bandage out of tissue and a bungee cord. The contraption works for the time it needs to but has a low rating on comfort level. Arriving in Petoskey, we veer off the Wheelway and meet some friendly Petoskey locals. As we bike along a house-lined street, a couple pulls up next to us and, eyeing my bungee cord bandage, asks if we need a first aid kit. We accept their kindness, and the bungee cord goes back in the pack. Thank you, Good Samaritan Petoskey couple. Onward, and soon we reach the entrance to what is the most historical 2.5-mile section of The Little Traverse Wheelway. 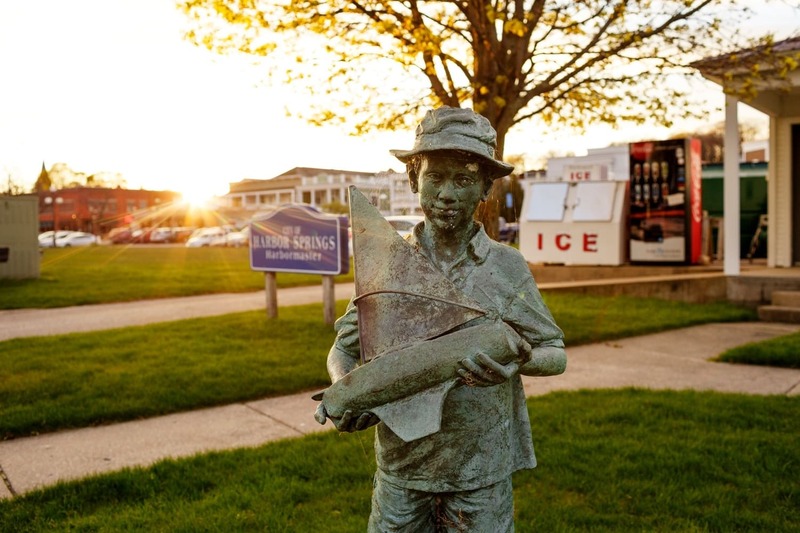 It traces through Petoskey’s Bayfront Park and is home to the history museum, which is a perfect stop to learn more about the history of the Little Traverse region as well as the Wheelway Trail. Most notable is that it dates back to the 1800s and was originally used by the locals as a bicycling and walking path. Although railroad tracks eventually displaced the trail, it was reclaimed as a bicycling and walking path in the 1990s. We slow to a stop at the trail entrance, and Katherine forgets to unclip her feet from her pedals; she tips over for the second time that day. Finding this funny, because it was, I laugh so hard I lose balance and tip over, too. At this point Chris excuses himself to escape the slow-mo pileup and heads to the bike shop for shoe cleats. Petoskey is an excellent stop for shopping, lunch, or in this case, happy hour (which we all needed at this point … or maybe definitely didn’t need?). In the middle section of Bayfront Park a pedestrian tunnel runs under US31 and connects to downtown Petoskey; we take it. 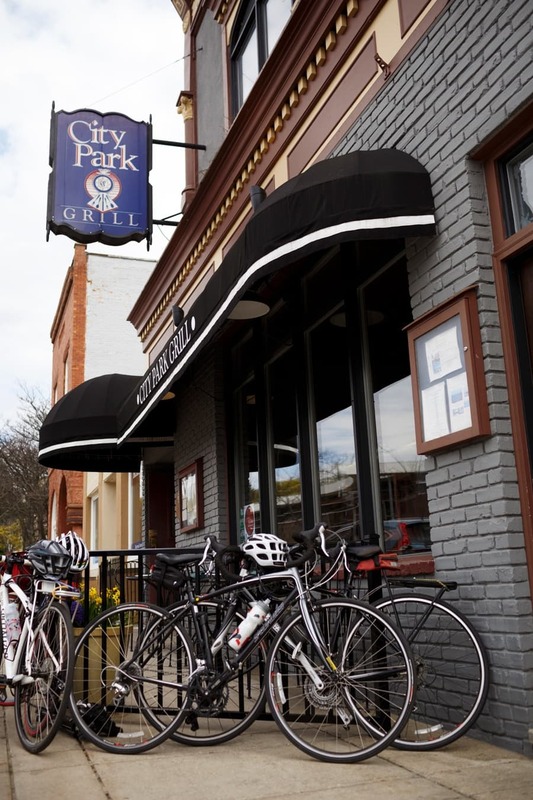 We decide upon a local’s favorite venue, City Park Grill, for snacks and a beverage. It’s also an ideal time to add another friend to our adventure. Tabi joins us after parking her car at a city lot. 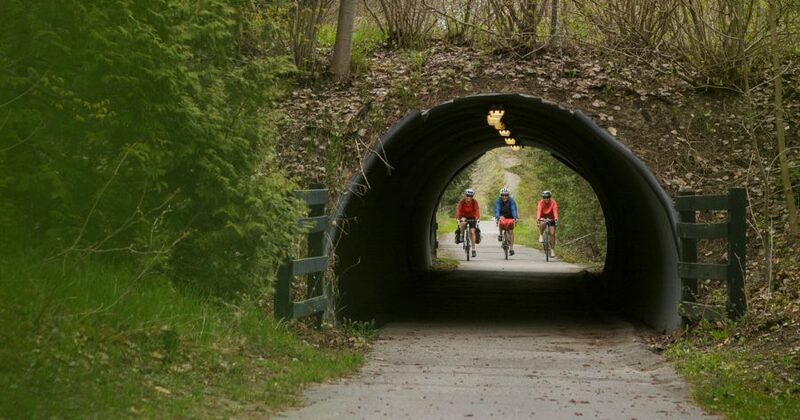 She hops on her bike and continues with us as we go back under the tunnel and ride the trail toward Harbor Springs. We pause for a photo at the Wheelway Arch, contemplate a beer at Petoskey Brewing Company (as it’s right off the trail). 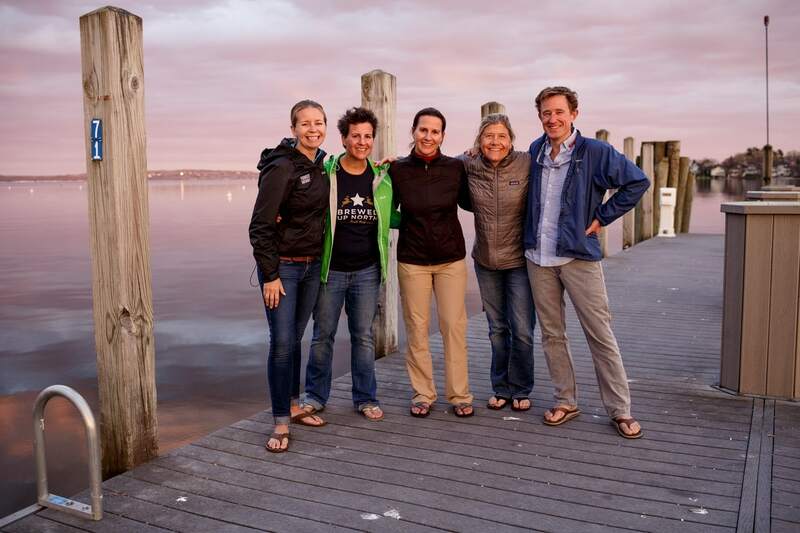 Instead, we elect to keep going as we were beginning to lose daylight and want to explore Harbor Springs at sunset. At this point, the trail takes on a bit more motorized feel because it hugs the road quite a bit, so we choose to take this stretch at a faster pace. As we pass the Harbor Springs airport, we stop and strike up a conversation with a man walking his dog. Turns out he’s on the Wheelway’s board of directors. He greets us warmly and is happy to hear about our overnight bike trip. 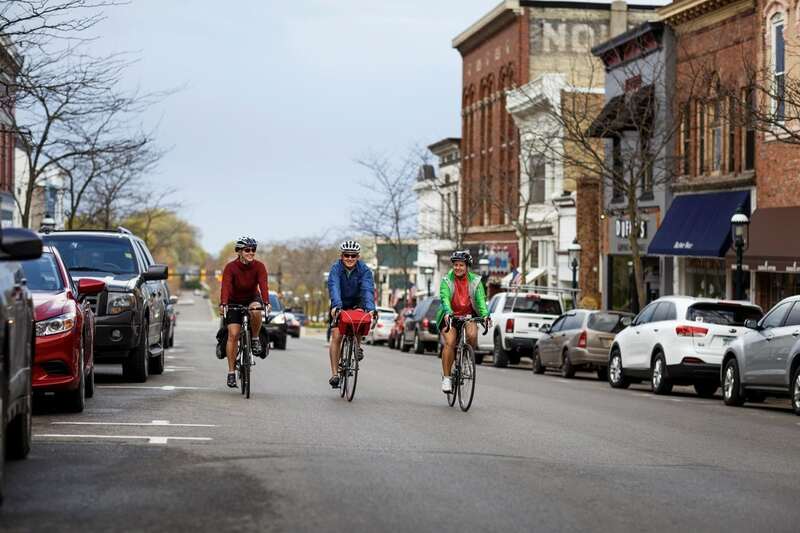 Planning ahead is important when staying overnight in a seasonal town such as Harbor Springs. Knowing we were pre-Memorial Day, and the downtown hotel was still closed for the season, we instead rented a house not far from downtown. We unpack, change clothes, and head out for a walk around Harbor Springs and to find dinner. The evening is a pleasant spring one, and as we walk along the empty marina docks we take in views of water and town glowing under a vibrant springtime sunset. Afterward, we make our way to dinner at Pierson’s Grill and Spirits. Midway through dinner, we realize we are sitting in silence. The day has been long, and the exertion is beginning to show. The town’s relaxed vibe sends us on a moonlit walk back to our rental to unwind from our day and recap all that unfolded. In the morning we rise and move as efficiently as possible to pack up for the ride back to Charlevoix. This day would not be as eventful as the first, for we do not have the same luxurious timeframe. We also choose to alter the route between Harbor Springs and Petoskey by taking Beach Road out of town, as it’s more scenic and hugs the water, and the traffic is low. Just four miles down the road, we make our first stop, at Petoskey State Park, to take in the sand dune and beach views. Noticing a storm rolling in on the weather radar, we time the leg to Petoskey perfectly to have lunch and wait out the storm. As we lock up our bikes and head inside Julienne Tomatoes, the first raindrops begin to fall. I replenish with quiche, fresh fruit and coffee. For dessert, we share a lemon raspberry tart and sugar cookies shaped and decorated like tomatoes. We watch the rain through the glass, enjoying our cozy moment. As we make our way from Petoskey to Charlevoix, we stop only twice more: once to check out the monument to the Big Rock Point Nuclear Power Plant (now decommissioned), and once to wrap up our adventure with one of my “riding back and forth for the camera” ideas. Specifically, I have my friends ride through rain puddles—again … and again … and again. Turns out that getting wet and muddy on a bike makes you smile even when you’re a grownup. Arriving at our car at the Charlevoix Township Park, I pause to consider that I’d never been on a road bike until a day prior. Keep calling with adventures you concoct for me, Traverse Editor, I’ll always answer. Beth Price takes photographs that reflect her passion for a healthy, active and adventurous lifestyle. She is based in Traverse City. bethpricephotography.com.